DWTS Season 14 – Rumor Round Up!! You’ll notice that ProWatch is no longer in this spot – it had it’s day and I’m afraid we’re going to get nothing more until Tuesday. If you still want to visit it, you can here —> ProWatch. Every season around this time we create a listing of people who have been rumored to be on the show for this season…and sometimes past seasons, if we see “suspicious” behavior. Things that make you go “hmmmm…” Well, thanks to Vogue, who keeps a list, here we are again. Seriously – thank Vogue because I don’t have the time to hunt them all down, sadly. Wish I did. ETA an update to Troy Aikmen. See below. Jack Wagner, Melissa Gilbert and Sheri Shepherd – when TMZ first reported on this one, I was skeptical. TMZ has a bit of a spotty record, although some have forgotten. A couple of seasons ago, they got the whole cast exactly right, but last season I tend to think they got played. They got exactly nobody right…they claimed Nancy Grace, but AFTER others (including us) had reported it. But, Gossip Cop backed them up this time, so I have to give it more weight. Of all the sites out there, Gossip Cop not only confirms some rumors, but puts the kibosh on others – some that I knew to be false. They are more reliable, IMO. So…I have to say that I think this is the real deal. Melissa and Sherri are also past seasons rumored contestants – and we know that happens quite a bit. As for Jack, well, ABC Soaps in Depth said they heard a former GH star was dancing, hand Jack was let go from The Bold and the Beautiful (a CBS soap), so that kinda opens a window for him, eh?? As for the video of Melissa going into the DWTS studios…well, that doesn’t look like the normal entrance, but the building structure seems the same. If so…well, doesn’t that eliminate her as Maks’ or Derek’s partner? Unless Derek was fibbing about when he starts rehearsing (next week, per Derek on Ryan’s show). Annika Sorenstam – Pro Golfer rumors coming from all sides, including golf aficionados, Tony Dovolani and Annika herself. This one seems plausible, but not as plausible as others. She said she would like to do it, some on twitter are claiming she said yes (although those tweets read kinda weird to me). Vince Young – Vince straight up said that he had been asked to be on DWTS. Couldn’t tell if he was joking, but the fact that he deleted the tweet was kinda telling. Of course, being asked doesn’t mean he said yes. Dolly Parton and Gavin Degraw – Both of these rumors came from Hollywood Life who, unfortunately, did not have a good track record last season. And we haven’t heard much about it since the original posting. Not to mention that Dolly, when previously asked, said “hell no”. At first I considered Gavin a more real possibility, but now I’m not so sure. UPDATE: He tweeted earlier today that he’s on his way to LA. Hmmm…. Aferdita Dreshaj – Miss Kosovo said not long ago that she was dancing on DWTS – but was she talking about the Kosovo version of the show? Probably – which is why I stuck her in this category. Bruce Jenner – Bruce I could handle, but I gotta say no to any other Kardashian relatives. 🙂 This comes from Hollywood Life once again. Paula Deene – Hollywood Life was throwing a bunch of stuff at the DWTS wall and waiting to see what would stick. Paula was one of their rumored dancers. I will be curious to see if they get any right. Bar Refaeli – She was rumored as in negotiation, but it was by a website that I had never heard of before. Not really sure what to make of it, actually, but why would she do it? Today, Taylor Armstrong was a guest on Ryan Seacrest’s radio show. Unless something changes, many of you can take a sigh of relief (as well as myself, lol). According to the interview, Taylor says she hasn’t been approached by Dancing With The Stars to dance, but, she says she can dance and she might be open to it if approached. Thanks to Lori for this news! ADDING: And on that note, Bar Refaeli won’t be dancing either as rumored. You can view a video at Access Hollywood where she says she doesn’t have time. Heidi: First up, we have yet another NFL player that someone is claiming to be on DWTS this season – Jeremiah “The Axe Man” Trotter. I found this in my random perusal of various twitter searches. 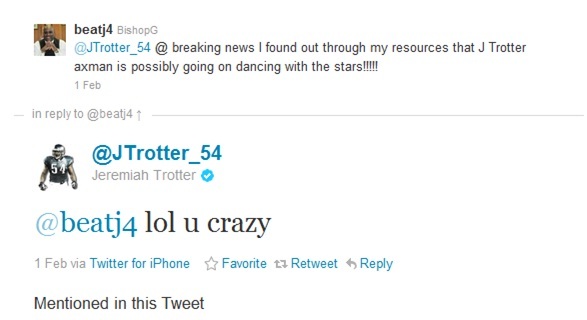 I have no idea if the person claiming he heard Jeremiah is even remotely serious or remotely connected – but Jeremiah’s non-denial is interesting, plus I remember how I didn’t blog about knowing that a Steeler was going to dance. A month before the announcement. 🙂 ETA: The tweet I posted a bit ago about Vince Young, also from the Eagles, makes this one seem like the person with the info got the wrong player. Hard to say. Courtney: Admittedly, this is EXTRAORDINARILY vague. Kirstie could just be trying to coax Lisa Marie into participating in her “100 Days of Dance” event, or she could be just using it in the figurative sense, as in “Yay! You’re another year older! Do some sort of celebratory dance!! !” However, some interpreted it as “Get ready to hoof it on DWTS soon!” Could Lisa Marie be signed up for season 14? Who knows…but her mom did the show in season 6, and doing the show might help Lisa Marie spread the word about several charities she’s involved with. However, according to Wikipedia, she currently lives in London – so who knows. Food for thought. 🙂 I think she’d be a great addition to the show – she seems to shun the spotlight, but she looks FANTASTIC for her age and seems to be in good shape. But I must say – Wendy does look quite fetching in green fringe! If memory serves, I think Jackée has been a rumor before…or maybe a campaign. IDK. Too much going on in my head 🙂 Either way, she’s funny…I think she’d be kinda like Niecy. In fact, I think she’s actually friends with Niecy. Vogue: I can’t see it. I just can’t. 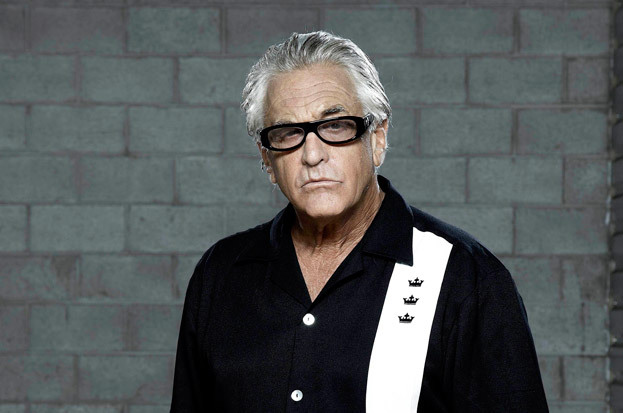 Courtney: If Reuben from Ocean’s Eleven had a drunken love child with Charlie Sheen’s character from Two & A Half Men, it would be Barry Weiss (whose name makes me want a beer). Vogue: Then there is Sam Champion…yes, Sam strikes again! Check out this little ‘retweet’ Sam made this morning. Why would he retweet this if he wasn’t dancing on Dancing With The Stars Season 14? This guy is going to give us serious heart palpitations with all of this TEASING!! With the added anticipation of Madonna dancing in the Super Bowl, I’m dying here. 😯 Bring it Sam or ELSE! RT @Cyn90: U wonder why those #DancingwiththeStars rumors fly when u show that smooth sway move @SamChampion? ( WE'll FIND OUT SOON! NOTE the Question Mark in the title!! The source on this occasion is Hollywood Life and they, like so many others, were wrong as often as they were right before last season. Especially this early in the game. HollywoodLife.com’s ‘Dancing With The Stars’ insider says Beverly Hills housewife Taylor Armstrong and TV Legend Regis Philbin are on the producers dream list. What would you think if they joined next seasons cast?